Help your hair take on the perfect definition and volume with Redken Styling - Rough Paste. Featuring cream ingredients, this rough paste helps soothe and moisturise your hair. Conditioning agents leave your hair silky smooth, making it easier to work with in the morning. Thanks to UV filters, colour-treated hair is fully protected. A unique, pliable consistency helps you restyle hair until you are satisfied with the results. Rough and tangled hair is no match for this styling paste, which comes in a 75ml bottle. 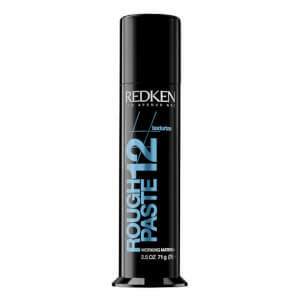 Directions for use: Use this rough paste on damp hair until it has airy volume and fullness. Keep reapplying layers as needed.